As promised here is part 3 of the baby fever series. If you haven’t read the other two parts yet, you can find part 1 here and part 2 here. This time, the set was for a baby girl my oldest best friend was having, plus a little something extra special which I made for the first time and hope to be making more of in the future. As I said in previous posts, I always try to find different patterns to make (even though it’s not always possible), both for my benefit of improving my technique and also for the fact that I wish to give unique gifts to my friends. For this set, I actually bought the wool first. I saw this fun colour at John Gregory’s Wool shop and thought it would be perfect for my friend’s baby. It’s the Peter Pan Baby Prints DK in Sprinkles (no. 782) and you can buy it here. * I really like this wool because it’s just so soft and gentle for babies. Anyway, on to the pattern now. 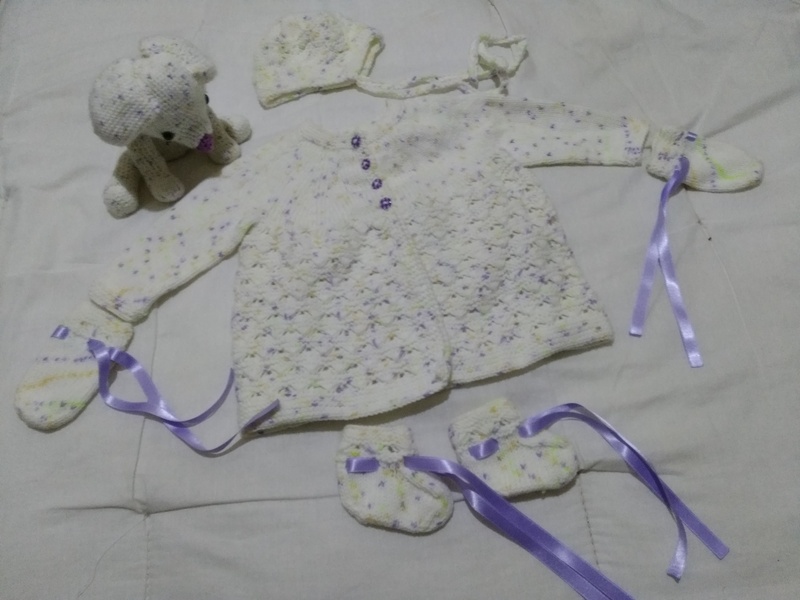 I found this really lovely set which includes a cardigan, a hat, mittens and booties as well as a blanket. It’s not free but it’s a good price for the amount of item patterns it has and it’s a downloadable pattern. I really liked the scallop-y pattern of it and it was definitely something new for me to learn. It’s a fairly easy pattern to follow and it also includes video links which show you how to do the more complicated stitches. The cardigan came out really nicely, as you can see below. For the buttons, I bought similar ones to the previous baby set in the series (Part 2) – checked buttons but this time in purple. I thought they matched the wool really nicely. Then it was time to make the mittens and the booties. Everything was just so simple to make, it’s almost unbelievable. And the ribbon just gives them an extra delicate flair, don’t you think? It was my first attempt at making an amigurumi and I think it was not bad for my first time. I left out the neck accessory as I thought it would be dangerous for a baby. But all in all, that’s the entire set all together and I think it turned out lovely. What about you guys? Have you done any amigurumi? If so, let me know how they turned out and send me pictures if possible. I love to see other people’s craftwork. In the meantime, I wish you all a good Sunday and happy knitting/crocheting! This is an affiliate link. I will earn a small percentage of the amount with every purchase made.